The inspiration for today’s lesson came from the first question Joe asked when he woke up. I hadn’t planned to talk about frogs. I’d planned to work on letters with Jake and addition with Joe. But Joe was interested. He wanted to know how a frog was born. So I ran with it…eagerly and with excitement. Crazily enough, I’d printed out a frog packet months ago and stuck it in a folder for later use. 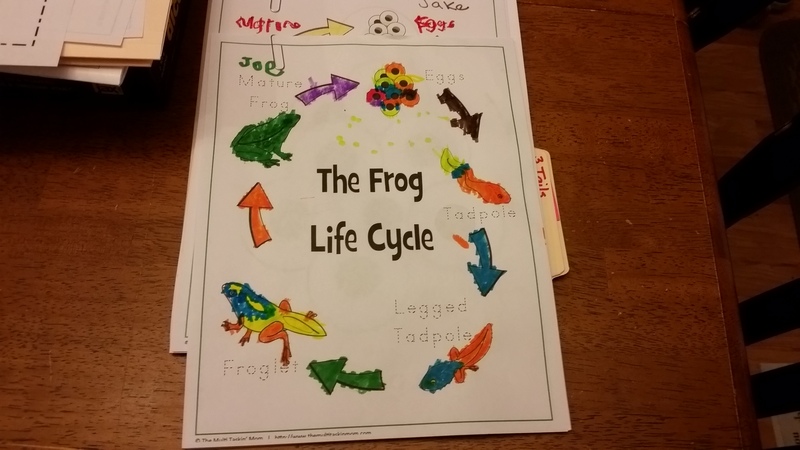 First, we talked about the life cycle of a frog. After Joe could tell me each step, it was time to color. Joe got pretty creative with his. 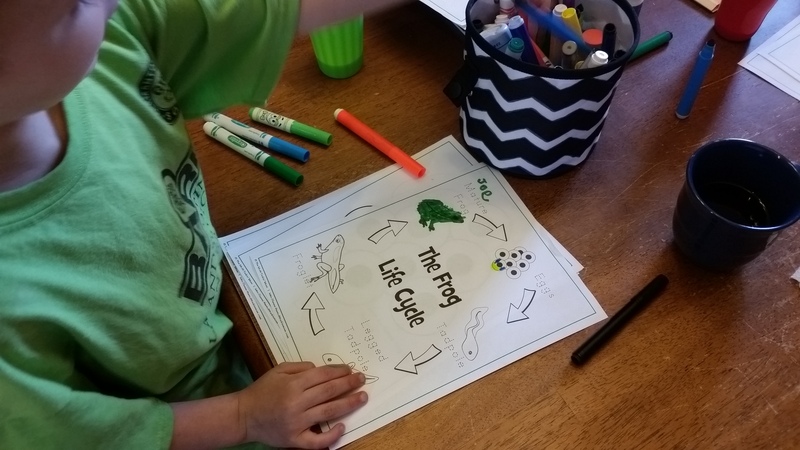 Every egg was a different color, the tadpole had stripes, the legged tadpole was blue and orange, the froglet was multi-colored and the frog was green…a true transformation. 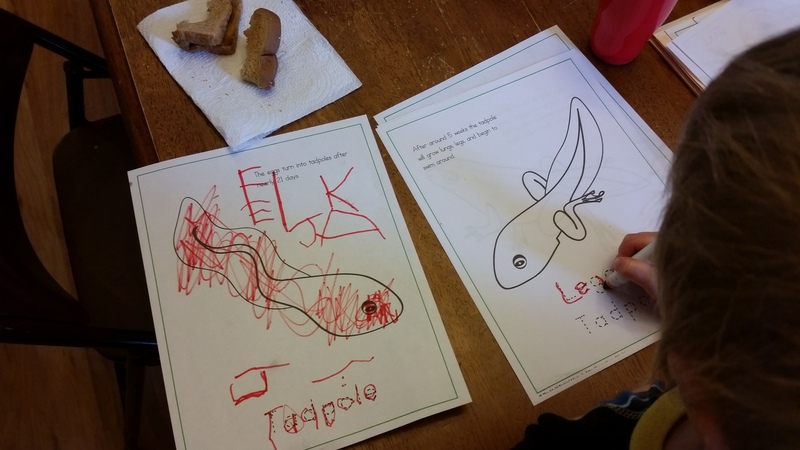 Jake did an awesome job tracing his letters and he even wrote his name…sort of. 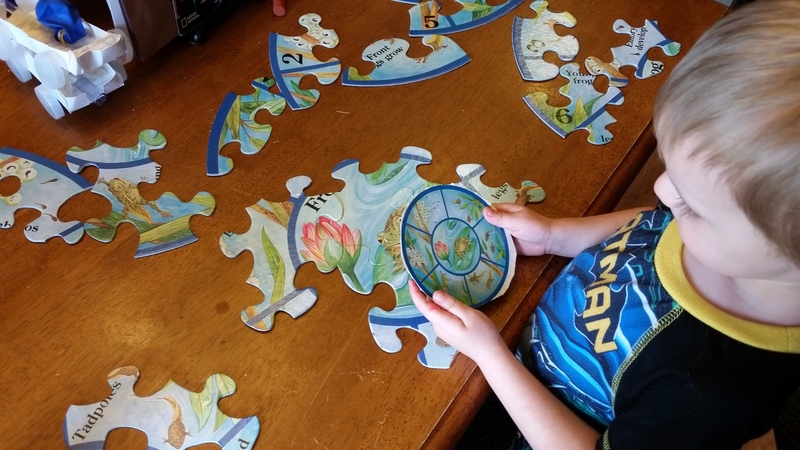 While Joe was coloring, I pulled out the frog puzzle I’d bought at a garage sale for 50 cents two summers ago. How fortunate that I was obsessed with finding educational materials as cheap as possible! Jake, my puzzle guy, put the puzzle together and then counted the steps while Joe told him what they were. 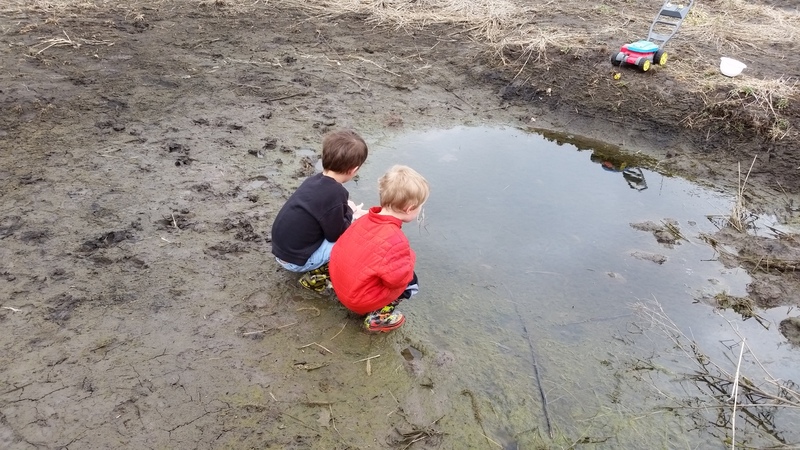 After they lost interest in the indoor fun, we donned our garden boots and play clothes and headed outside to our little pond to hunt for tadpoles, legged tadpoles, frog-lets and frogs. The boys searched quietly for a little while. 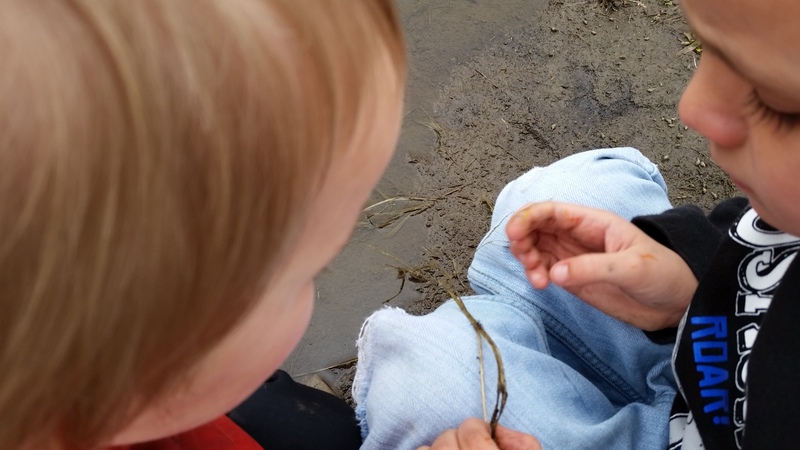 When they got bored being still and quiet, they started to dig with sticks and throw mud clods in the water. 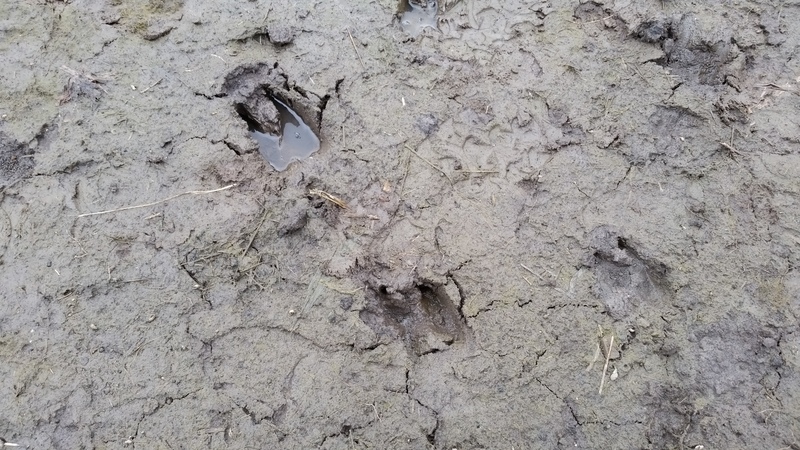 At one point, Jake’s boot got stuck in the mud and Joe fell (SPLAT!). Not seeing any frogs or tadpoles, the boys started exploring. 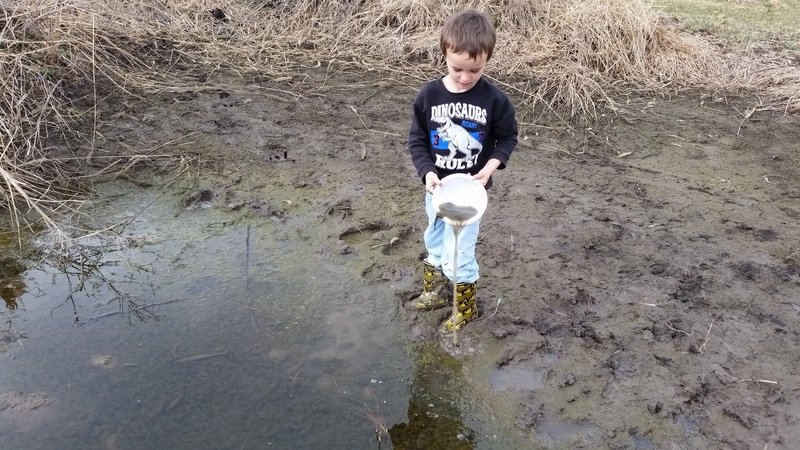 Joe got a bowl and started to sift and pour muddy, marshy pond water. We studied it and talked about it. It was rather large for a tadpole so we swished around the water and saw it had fins and the beginnings of hind legs. We touched it and Jake laughed as it moved under his finger. Finally, I told them that we needed to put it back in the water so it could continue to grow. They were disappointed but I told them that we could come back out and check on its progress every few days. They wanted to check the other side of the pond to see if they could find anymore. 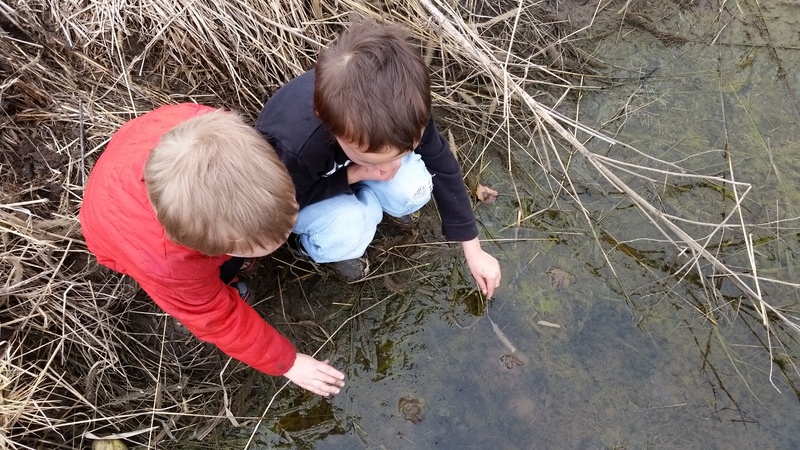 We ended up finding all kinds of water bugs. I’m almost positive we saw another fish. It was blackish gray on top with an orange belly, but it moved too quickly for us to catch it with the net. 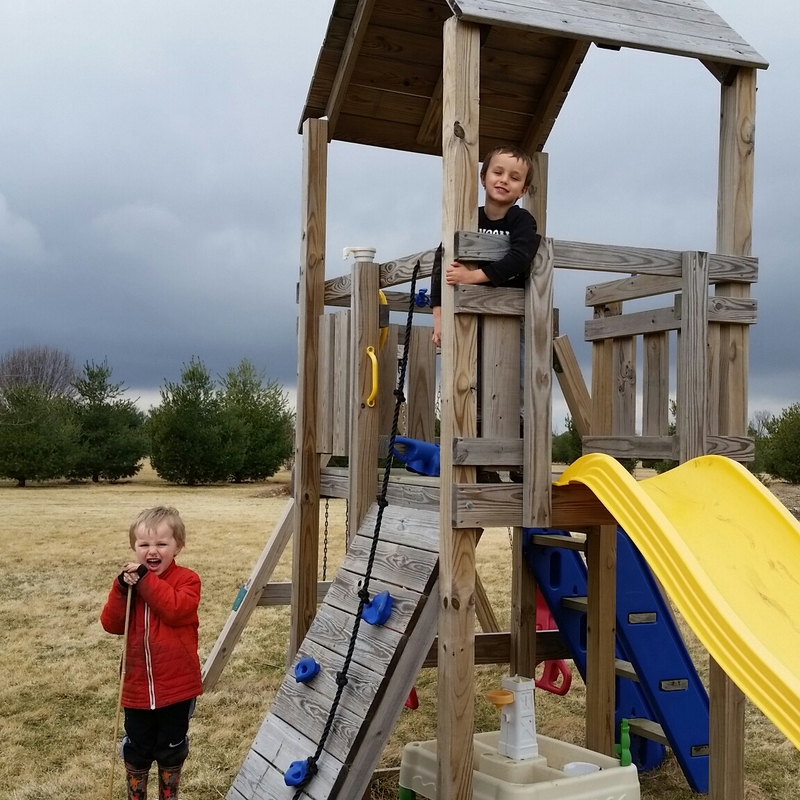 We spent all morning outside in the mud, only heading in when Joe thought a storm was coming. One question from my little frog hunter turned into an awesome science lesson. I think I was just as excited as they were. This entry was posted in 13 Skills, Education, For the Kids, Garden Stories, Life, Writing. Bookmark the permalink.